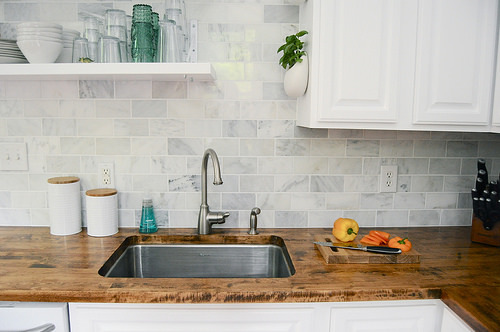 When you get ready for a change in the kitchen, think about the many ways that you can create an entirely new look with a few simple changes. Think about ceramic tiles. Ceramic tiles are the most common tiles used in kitchens. They are easy to install, durable and beautiful, and inexpensive when compared to tiles made of other materials. And, because of the materials that they are made from, they are available in practically every color and design imaginable. They are available in solid colors, printed designs and can easily be customized. Ceramic tiles for kitchen can be installed on the floors, on the kitchen backsplashes or on entire walls of the kitchen. They are available in every imaginable size and color. Installing ceramic tiles in the kitchen will add visual interest and value to your family’s favorite room in the house. Purchasing ceramic tiles for kitchen is a simple task because they are available in any home improvement store, in many specialty flooring or kitchen stores, as well as online. And, because ceramic tile is so durable and easy to clean, it will protect the covered areas, whether the floor or the walls, from food spills, stains, and other unsightly stains. Usually a simple wipe with a rag and the tiles are spotless. 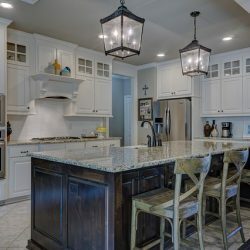 Most view the use of ceramic tiles in the kitchen as an opportunity to be creative and experiment with colors, patterns, and designs adding an individual touch of personality and style. There are as many designs to choose for your ceramic tiles as you can imagine. Your choices are only limited by your imagination but there are some more popular designs that tend to appear in many kitchens. 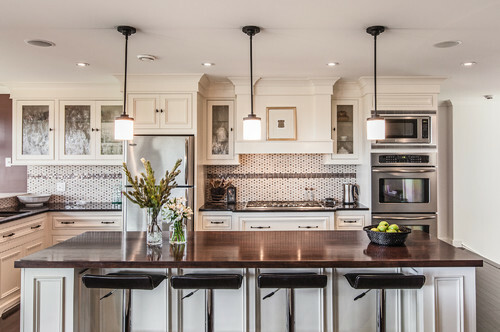 The most common method of ceramic tiles for kitchen design is referred to as the subway tile. It consists of light colored, classic solid color rectangular tiles that are laid with a matching light grout. The look is uncomplicated and complements any decor. Because the tiles are rectangular in shape, they can easily be laid in a geometric pattern of horizontal and vertical rows or at an angle. For more unique design choices, consider mosaic tile. Mosaic tiles are very small –usually about an inch or smaller – and are adhered to a mesh knit backing for easy installation. They are usually adhered already in a design that you can simply place on the wall where you would like the design to appear. Simply apply the tile adhesive to the surface, apply the entire design with the mesh backing to the surface, and that’s it. If you want a design pattern that looks individualized and beautiful with little fuss, mosaic tile is definitely an option. If you are on the adventurous side and are ready to make a statement, you can draw out the design that you have in your mind and then fill in the blanks with the right colors of ceramic tiles for kitchen, much as you would with a ‘paint-by-number’. Designs range from static patterns to actual pictures in the tile with a little bit of planning. Or, some designers purposefully break ceramic tiles into smaller, non-congruent pieces and then lay then in the tile adhesive for an eclectic, modern appearance. 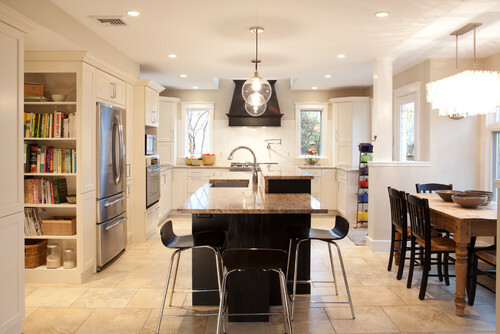 Consider the many ways that you can create the kitchen that all of Manhattan will envy with a few simple ideas. No matter what you are planning when you remodel your kitchen, ceramic tiles can add creativity and beauty to any design or decor. With your partners at Home Art Tile, whatever you can imagine can become a reality. 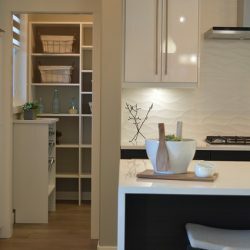 Ceramic tile is a simple, affordable and easy to use home improvement material that can turn even the smallest kitchen in Long Island into the favorite room in the house!